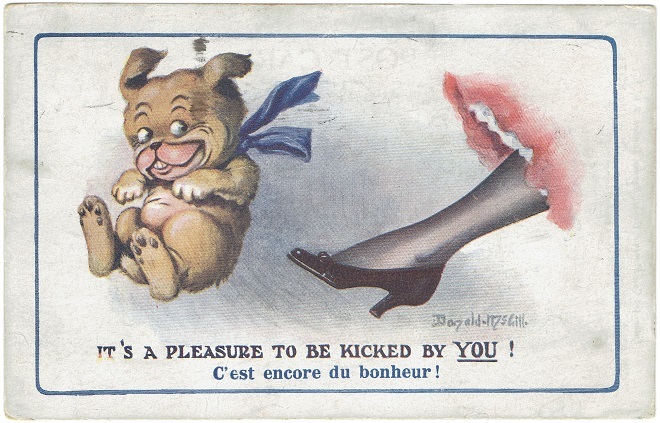 Co. C - 308th Motor Supply Train "World War One Post Card"
This is an original censored WWI AEF Comic Post Card dated August, 1918 and franked with stamp "Soldiers Mail". 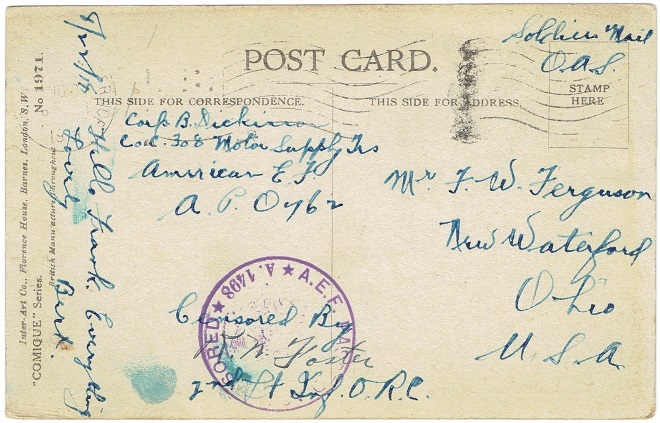 The Card was sent by Corp. B. Dickinson to Mr. F. W. Ferguson, New Waterford, Ohio. The address it was sent from was somewhere in France on this date. ALBERT E. "BERT" DICKINSON was born on April 27, 1893 in Manchester, England to Harriet Nott (1858-1929) and Albert J. Dickinson (1856-?). He enlisted in the National Army (#1959449) on October 6, 1917 in Youngstown, Ohio. After joining the military he was attached to Supply Company 332nd Infantry, 83rd Division until 29 Dec 1917. He remained with that division for the remainder of his military carrier. 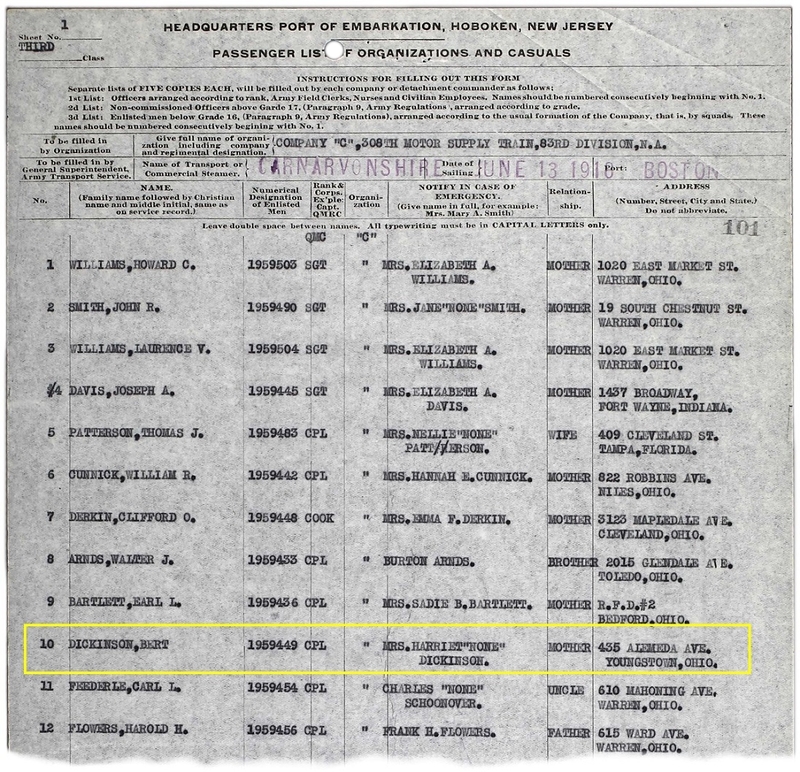 Upon going overseas with the American Expeditionary Forces on June 13, 1918, he was attached to Co. C 308th Motor Supply Train until March 11, 1919. He served as a Wagoner from November 1, 1917, until he was promoted to Corporal on May 9, 1918. He was promoted to Sergeant on June 5, 1919, just one month shy of his Honorable Discharge on 19 July 1919. 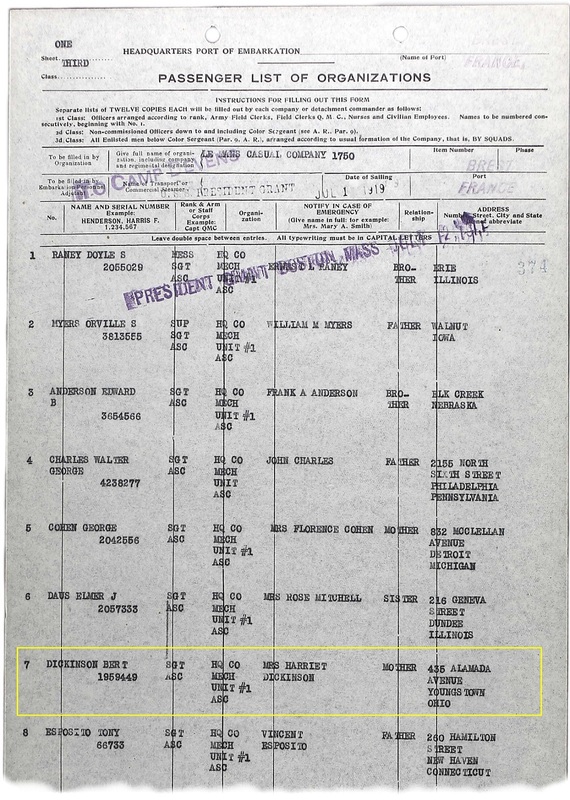 He arrived back in the US on July 12, 1919 and was honorably discharged one week later. He married Helen Gertrude Bilger (1900-1970) on July 19, 1922 in Columbiana, Ohio. Helen was a bookkeeper and Bert was a merchant at that time. They had one child during their marriage, William Albert Dickinson (1926-1983). 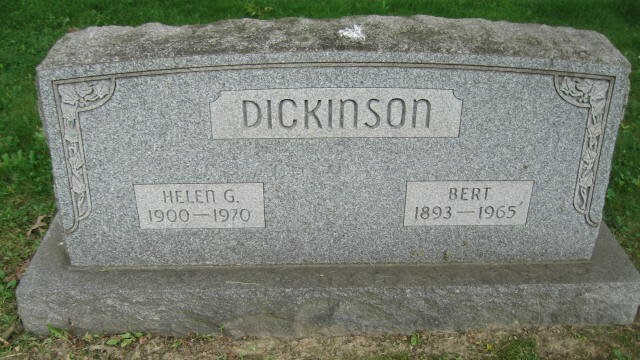 Albert "Bert" Dickinson died on September 22, 1965, at the age of 72, his wife Helen died in 1970, they where buried at the Columbiana Cemetery, Columbiana, Ohio.